The recovered jewelries in position from the suspects. Camp Sec. Kangleon, Palo, Leyte – A father-and-son tandem were arrested, together with the later’s live-in partner, and more than one million pesos worth of jewelries were recovered in a follow-up operation by the elite Regional Special Operations Group (RSOG8) of the Police Regional Office 8 (PRO8) against suspected thieves in Catbalogan City on Wednesday afternoon. Police Chief Superintendent Elmer Ragadio Soria, PRO8 Regional Director, identified the suspects as Edwardo Pacayra y Fillas, 65, married, a barber by occupation; his son Darwin Pacayra y Ontoca alias Daroy, 27, tricycle driver and Darwin’s live-in partner Mariton Cinco y Borja, 20, jobless, all residing at Pier 2 site, Brgy. 4 in Catbalogan City. “Our men conducted follow-up operations in connection with a thievery incident in Catbalogan City some two weeks ago victimizing a couple engaged in selling jewelries,” Soria informed. Investigation conducted led to the identification of the suspects and the location of their hide-out, prompting the police to apply for search warrant that was granted by Judge Agerico Avila of Regional Trial Court Branch 29 in Catbalogan City on Wednesday morning. 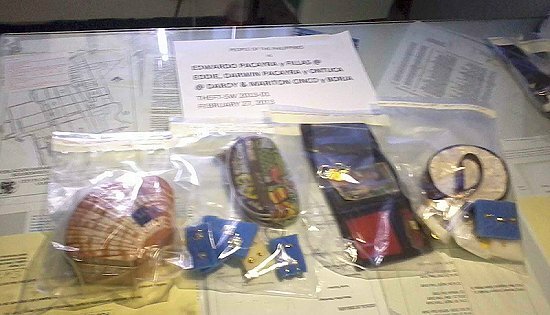 At around 5:00 o’ clock Wednesday afternoon, joint elements of RSOG led by Police Inspector Constantino Jabonete, Jr. and Catbalogan City Police Station led by Police Superintendent Avelino Doncillo, Jr. raided the suspects’ lair that resulted to their arrest. The raid also led to the recovery of 14 pieces assorted gold and diamond jewelries amounting to more or less 1.2 million pesos that was part of the more than two million pesos worth of loot that were stolen from the victims. Apart from the jewelries, the lawmen also found a caliber .38 revolver loaded with one ammunition and one caliber 5.56 revolver with 6 live bullets and one ammunition for 12-gauge shotgun. “Cases for theft and illegal possession of firearms in relation to Comelec gun ban are now being readied by Catbalogan police station for filing in court against the suspects,” the Regional Director added. The top police official further informed that follow-up operations are also being conducted to recover the more than 800 thousand pesos worth of jewelries that were either sold or pawned by the suspects. PASAY CITY – Members of the Senate have the responsibility to make the use of their Priority Development Assistance Fund (PDAF) transparent and relevant, Senator Chiz Escudero said. Questions were raised on the use of the senators’ PDAF following a newspaper article, quoting a Commission on Audit report, alleged that P195 million in PDAF of three senators and a member of the House of Representatives were channeled to a “questionable” non-government organization. While Escudero said questions over the PDAF use would best be addressed by CoA, the agency mandated by the Constitution to look into government funds, senators also have a responsibility to be transparent with their PDAF allocations. “I believe members of the Senate, present and future, should adhere to the principles of good governance when it comes to public funds such as our PDAF,” the senator said. “At the same time, we have a responsibility to protect the integrity and the reputation of the Senate as an institution and as a pillar of our democracy. This should be non-negotiable,” Escudero added. The senator said his PDAF was used for the construction and rehabilitation of public markets nationwide, and to provide medical assistance to indigent patients throughout the country through regional hospitals. “The funds from my PDAF augmented local government funds and were all downloaded to local government units. These are all posted on our website www.chizescudero.com for public viewing and scrutiny,” Escudero said. MANILA – The government is focusing to get more foreign investments in three priority sectors, namely tourism, agriculture, and infrastructure, Vice President Jejomar C. Binay said. Speaking during the Arab Gulf Programme for Development (AGFUND) awarding ceremony Monday night, Binay said tourism has an “immediate effect” on the Philippine economy with one new job created for every tourist that arrives. “Tourism, for us, is a key sector that could really have a significant impact on this administration’s twin goals of poverty reduction and inclusive growth,” he said. “This administration has been working towards rice self-sufficiency by going back to the basics and helping our farmers through improved irrigation systems and, among other things, a genuine certified seeds program,” he said. “Another sector that we want to prioritize is infrastructure because it is the key to further growth and development in tourism and agriculture, among other sectors. The lack of paved roads or adequate transportation hubs has a direct effect on the quality of produce and the convenience of tourists who wish to see the different parts of our country,” he added. The Vice President called for continued collaboration between the government and the private sector, including international organizations and other stakeholders towards attaining inclusive growth, sustainable progress and greater peace and stability. “To make all these possible, it is incumbent upon the different sectors to bring their expertise to the table; it must involve everyone. Nation building is never about those at the top huddling together to impose their ideas on everyone else; it is about the whole spectrum of society pulling together, steadily marching together towards a single destination,” he said. The AGFUND International Prize is regarded as an extension of AGFUND’s advocacy on human development. It covers a variety of fields such as poverty alleviation, microfinance, water, environment, rural development, health, education, women and child development, youth empowerment, technology, and food security. AGFUND was established in 1980 upon the initiative of His Royal Highness, Prince Talal Bin Abdul Aziz Al Saud of the Kingdom of Saudi Arabia, with the support of leaders of the Gulf Cooperation Council Countries including the United Arab Emirates, Kingdom of Bahrain, the State of Qatar, the Sultanate of Oman and the State of Kuwait. MANILA – Greenpeace today renewed its demand to governments around the world to end illegal, unregulated and unreported fishing. The call for stricter enforcement and the elimination of loopholes in fishing regulations came this week as Interpol convened its first ever meeting to address the illegal fishing crisis in Lyon, France. As back up to its call, Greenpeace released the detailed documentation of illegal fishing activities encountered during two ship expeditions in the Pacific and Indian Oceans in late 2012 highlighting the need for urgent action. The evidence included documentation of illegal activities last November by Indonesian-, Philippine-, and Cambodian-flagged fishing vessels in the Pacific. It also included details of Greenpeace encounters with fishing vessels from Japan, Taiwan and Sri Lanka engaged in illegal or suspicious fishing activities in the Indian Ocean. All vessels were taking advantage of poor at-sea enforcement and loopholes in the law. As overfishing decimates fish stocks, fleets are moving further and further from homeports to catch valuable fish species such as tuna. Greenpeace is demanding that governments prohibit the transfer of fish at sea, end fishing vessels’ ability to hide in ports or under flags of convenience, require identification devices such as AIS and improve at-sea control and enforcement. “Illegal fishing continues to expand and much of what happens at sea stays at sea and escapes all control,” said Sari Tolvanen, Greenpeace International oceans campaigner. Greenpeace is making available the results of its 2012 expeditions in the Pacific and Indian Oceans to law enforcement officials at the Interpol meeting and will also deliver these evidences to relevant fisheries management authorities. "The destruction of the marine environment and the unchecked increase in fishing capacity across the world has led to the collapse or decline of fish populations worldwide. This is also true in Southeast Asia where fishing vessels are now going farther out to sea to catch fish and in many instances through illegal means," said Mark Dia, Regional Oceans Campaigner for Greenpeace Southeast Asia. “Illegal fishing cannot be stopped through stricter law enforcement alone: fishing quotas must be set at sustainable levels. This needs the cooperation of governments, such as those here in Southeast Asia,” added Dia. Greenpeace is advocating that more financial and human resources be allocated to control activities at sea and along the fisheries chain of custody, and that loopholes such as transfer of fish at sea be banned. This should be accompanied by steep cuts in industrial fishing capacity that lead to illegal fishing and overfishing. Interpol can take a lead by enabling the sharing of data and best practices, and push for strict enforcement and proper prosecution of individuals and companies in involved in illegal fishing. Suspect Vivencio Abasola who was arrested by RSOG in a follow-up operation in Sierra Islands, Catbalogan City on Friday afternoon. The police recovered the stolen bancas and engines, with shotgun and caliber.38 revolver from the suspect. CAMP SEC. KANGLEON, Palo, Leyte – The Regional Special Operations Group (RSOG8) of the Police Regional Office 8 (PRO8) arrested a man for selling a stolen motorized banca and for resisting arrest by firing his gun to police authorities. 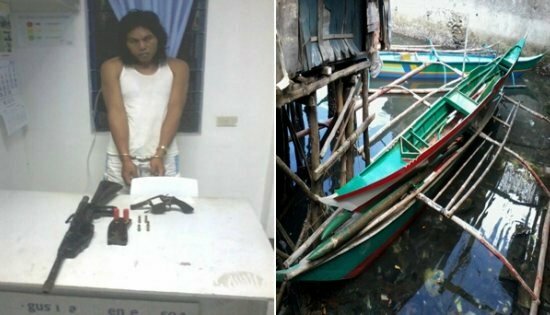 Eastern Visayas top police official Police Chief Superintendent Elmer Ragadio Soria identified the suspect as Vivencio Abasola alias Dagul, 31, married, fisherman, who was arrested in his hideout at Sitio Baras, Brgy. Cinco in Sierra Islands, a group of islands composed of 7 barangays, which is an hour motorboat ride northwest of Catbalogan City proper. Soria informed that a flash alarm from San Isidro Municipal Police Station in Northern Samar was relayed to all police stations and operating units about a piracy incident wherein a motor boat with 5.5 horsepower Honda engine owned by one Barnesto Hermosa of Brgy Caglanipao Norte and 4 other motor engines were carted by the suspects. On Friday morning, RSOG received intelligence information that a man was selling a motorized banca that fits the description of the stolen motorboat. Upon confirming the veracity of the report, RSOG led by Police Inspector Constantino Jabonete, Jr. proceeded to the area for follow-up investigation and appropriate police operation. Upon reaching the place, Abasola sensed the presence of the police team and opened fire to the approaching lawmen and ran towards his house where he was collared after a brief chase. Recovered from Abasola was one caliber .38 revolver with two live bullets. Police also recovered in the suspect’s residence a homemade shotgun loaded with 2 live ammunitions and in the area 3 spent shells of .38 caliber. RSOG also seized the motorized banca being offered for sale by the suspect and two other motorboats with Kembo 7.5 horsepower and Kama 10 horsepower, respectively and two other bancas without engines, believed to be part of the loot since suspect was not able to present documents of ownership on said boats. Suspect was immediately brought to Catbalogan City Police Station for proper disposition as case for Illegal Possession of Firearms in relation to the Comelec gun ban and Direct Assault Agents of Person in Authority is being prepared for filing against him. “An investigation is also being conducted for possible involvement of the suspect in piracy and other illegal activities,” Soria further informed. CEBU CITY – The Ramon Aboitiz Foundation Inc. (RAFI) launched Akong Bugsay on Feb. 19 at the Eduardo Aboitiz Hall of the Eduardo Aboitiz Development Studies Center. 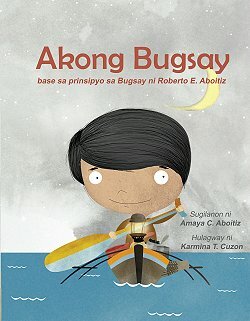 Akong Bugsay, which is written by Amaya C. Aboitiz, is an illustrated bilingual children's book that teaches the famous Bugsay principle of RAFI President Roberto “Bobby” E. Aboitiz. The story revolves around the first fishing trip of Andoy, accompanied by his father who is a fisherman. "Just as the bugsay philosophy inspired individuals and groups in business and government, we believe that it can also be shared with children. Just like Andoy, young children have goals. They are excited and curious and want to do new things. Just like his father, we can guide them, help them to plan, encourage them and model ways to face challenges. Young children can start setting short term goals and with our help they can succeed. Success breeds success, confidence and the desire to continue towards bigger, better things," Amaya Aboitiz said in her speech after the storytelling. "The book that we have shared with you today is our way of bringing our efforts to even younger audience. It is a simple story with, we believe, a powerful message," she said. The Bugsay Principle is about having a goal, planning well, and working hard to achieve one's goal. The program includes a storytelling by Vilma Laranas of Guadix Kiddie Center and her pre-school pupils. "RAFI believes in the power of the youth. We understand the opportunity we have to improve the lives of individuals and in doing so, the future of our country. We work towards a vision of a Filipino youth that is self-driven, goal-oriented, and who have a compelling sense of purpose in their lives," Aboitiz shared. The author also encouraged the audience, especially the teachers, to bring the book and its message to students, the community, and the education system. "We need people to help us come up with activities that will help teachers unlock the power of this book, the power that resides in each and every child," she urged. The launching was graced by representatives from the Department of Education 7, the academe, teachers, teacher educators, librarians, literacy advocates, and the media. Copies of the book was sold at the venue at P150 each while the coloring book cost P50. For every book sold during the launch, a copy of the coloring book will be given to supported schools of RAFI's Dolores Aboitiz Children's Fund (DACF). To purchase the book, you may visit RAFI's Casa Gorordo Museum shop, or contact 255-5630 and look for Joem de Gracia. To order online and/or to get activity sheets and other related materials of the book, visit www.rafi.org.ph/publications/akong-bugsay. CAMP SEC. KANGLEON, Palo, Leyte – Police shot dead one of Samar’s Most Wanted person after a brief shootout in a coastal barangay in Calbayog City early Monday morning. Ambrocio De la Cruz, who eluded authorities for years, died after he was hit in the chest and legs as he shoot it out with lawmen while trying to escape. Police Chief Superintendent Elmer Ragadio Soria of Police Regional Office 8 (PRO8) said De la Cruz was charged with a crime of murder for the hacking-to-death of one Ervin Velarde on Christmas Day in year 2010 due to personal grudge. “De la Cruz was ranked number 6 in the list of most wanted person of Matuguinao town in Samar and is considered armed and dangerous,” Soria added. On Sunday, police received information of the suspect’s whereabouts in Brgy. Cagmanipis Norte, Tinambacan District in Calbayog City. A composite team composed of elements of Special Operations Task Group (SOTG-Samar), 8th Regional Public Safety Battalion (8th RPSB), Samar Provincial Public Safety Company, Calbayog City Police Station and Matuguinao Municipal Police Station proceeded to the area at around 4:00 o’ clock early Monday morning after confirming the veracity of the report purposely to arrest the suspect. The police team was clothed with an arrest warrant for murder issued by Regional Trial Court (RTC) Branch 41 Judge Feliciano Aguilar in Criminal Case No. 11-0519 against De la Cruz. Upon arriving at the area, the policemen immediately cordoned his safehouse and demanded the suspect to surrender but he opted to shoot it out with the police team and tried to escape by jumping through the window. The team fired back ending with De la Cruz bloodied on the ground with gunshot wounds in the chest and legs. Suspect was immediately brought to Calbayog City District Hospital for medical treatment but was declared dead on arrival by the attending physician. Police recovered from the scene the suspect’s caliber .38 Armscor revolver bearing serial number 31425 loaded with 4 live bullets and one spent shell of .38 caliber. “We are sending a strong message to criminals and wanted men that PRO8 is serious in our campaign against all forms of criminalities and accounting of wanted persons,” Soria added. PASAY CITY – The signing of the reparation law, which will provide P10 billion in compensation to human rights victims of martial law, gives true meaning to the celebration of the 27th anniversary of the Edsa revolt, Senator Chiz Escudero said. The law aside from providing financial compensation, also more significantly provides recognition to Filipinos who suffered under the martial rule of Marcos. Escudero, chairman of the Senate committee on justice and human rights, sponsored the measure, known as the Human Rights Victims Reparation and Recognition Act of 2012. The signing of the law during the People Power revolt festivities was fitting since the events of 1986 that led to the ouster of Marcos and Cory Aquino’s ascendance to the presidency marked the beginning of the rendering of justice for martial law victims, Escudero noted. “While it took all of 27 years for the state to finally recognize the atrocities it inflicted on Filipinos whose democratic rights were suppressed under Marcos, the compensation law seeks to give justice to victims of the dark days of oppression and hopefully give an assurance that it will not happen again,” Escudero said. Political detainees get from three to five points while those who can prove that their rights were violated under the Act are awarded from one to two points. Escudero noted that the Marcos compensation law is unique since it is the first time that a state recognizes a previous administration’s abuse on its citizens through reparation and recognition. He said the recognition given under the law provides victims of martial law who do not need financial compensation the rendering of justice from the state. “The expanded coverage of the law includes not only monetary compensation but also non-monetary benefits such as social and psychological assistance on victims of atrocities through different concerned government agencies. Instead of merely calling it compensation bill, we now call it the reparation bill,” Escudero said. The law also created a Human Rights Claim Board from where a victim of human rights violation during the Marcos regime is qualified to file a claim as stated in section 16 of the Act. Also under the law all those involved in the class and direct action suit in Hawaii against Marcos and all victims recognized by the Bantayog Ng Mga Bayani Foundation were accorded the same conclusive presumption of being human rights victims defined under the law. “Conclusive presumption means that any person who has secured or can secure a favorable judgment or award of damages from any court in the country arising from human-rights violation shall be considered conclusively as a victim without need of further proof,” Escudero said. The compensations will come from a P10-billion fund held in escrow, plus accrued interest, which was part of the amount transferred to the Philippine government by the Swiss Federal Supreme Court as part of the billions of pesos the Marcoses were suspected to have stashed abroad. There is no such thing as “permit to campaign/permit to win fees” and it is extremely malicious for a newspaper in the region to headline that NDF-Eastern Visayas “admits” there is such a demand on candidates seeking electoral access in revolutionary territories. Where else did this come from except from parroting the counter-revolutionary propaganda by the Aquino regime and its 8th Infantry Division? They campaign against the exercise of state power by the People's Democratic Government which imposes guidelines on candidates in the conduct of election campaigns in revolutionary territories. Such state power is widely recognized and respected and all candidates without exception must abide by the guidelines on election campaigns. Furthermore, the Aquino regime and 8th ID seek to divert attention away from the fact that the reactionary elections are undemocratic and are used along with state violence to keep the oppressive and exploitative system. The leading reactionary politicians in the region are all representatives of landlords and big business who oppress and exploit the people, and sell out national sovereignty and national patrimony to foreign interests. The worst of them have been big bureaucrats for long and turn their positions into political dynasties. There are the Petilla and Romualdez dynasties in Leyte who have been squabbling over the spoils of power since the Marcos dictatorship. There is the Tan dynasty in Western Samar whose matriarch and her four children are making it a family business to run the province. There is the Daza dynasty in Northern Samar which has been plundering billions in public works projects. These dynasties are also close collaborators with the military in wielding state authority and state violence to subjugate the people. They are oblivious to the military's human rights violations under Oplan Bayanihan. They support the 8th ID's surrender campaigns against the New People's Army. They legitimize the military's psywar campaigns and even share lucrative public works contracts. They connive with the military and police in running private armies and criminal syndicates. Thus the guidelines on the conduct of election campaigns are there precisely because of the people's demands against the tyrants who commit violence and bribery to get themselves elected. The People's Democratic Government ensures that the rights and interests of the people are protected and that elections are peaceful, orderly and beneficial. To do these, the People's Democratic Government has both the NPA and the instruments of political power as a rising revolutionary state coexisting with and confronting the reactionary ruling state. The people in the revolutionary territories are empowered in fighting for a genuine democratic system of governance to prevail, which even the reactionary politicians recognize and respect. Those who disparage the revolutionary movement and believe the ruling system is “democratic” and empowers the people are either exceedingly ignorant or hopelessly reactionary.